Editor's note: This article contains tweets that some may find offensive. Anthony Cumia, the "Anthony" half of the enormously unfunny shock-jock comedy team of Opie and Anthony—whose show by the same name airs on SiriusXM—was out late in New York taking photos, some of which included women dressed in club attire who did not give their permission to be photographed. He obviously found one black young lady to his liking, since he snapped a photo of her wearing a black dress. Cumia claims that he was just taking photos of the city, but unless he was trying to take a photo of a metal railing, the woman was the only thing clearly in the frame. When the woman approached Anthony for taking the unauthorized photo of her, Anthony claims he was "assaulted." He then took to Twitter to berate the woman, using every vile, derogatory name in his vile, derogatory arsenal. What was more shocking was Cumia's claim that the alleged assault was somehow an injustice upon white people—more specifically that the "savage" attacked him because he was a "white male." "It's really open season on white people in this day and age," he wrote. "No recourse. Fight back and you're a racist. The predators know this. Good luck." He also wrote that he hopes the woman is shot and killed. Yes Anthony, woe is you. And woe is social media that allows this much access to free thought without filter. And woe is the finger that pressed the button that took the photo of the woman who didn't want to be photographed. Woe is SiriusXM for having yet to issue a comment on the ordeal. Woe to all of us and, most important, the alleged five punches you took for being a white male and not for being a pervert taking photos of a woman you didn't know or who didn't give her consent to being photographed. Not only is there is a serious level of sickness in the idea that Cumia could take a photo of someone minding her business walking down the street, but there is also a sense of entitlement that allows him to believe that this woman can be called a "c—t" when he's approached about it. Anthony broke from his rant long enough to post another photo of a woman (presumably without her consent). Woe is you for suffering from delusions of grandeur, from the idea that black women who aren't fond of your advances must be subject to your vile Twitter rants. Because she wasn't amused by your antics, she has now become the subject of your Twitter timeline—photo and all—for the amusement of your 153,000 followers. 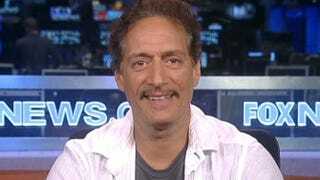 And yes, you, Anthony Cumia, are the victim. The victim of a "savage" woman whose night didn't involve you until you made it so. You are the victim of a misogynist's mind so limited in its thinking that somehow you truly believe yourself the victim. Thank God for all of us that your finger was only behind the trigger of a camera instead of something much worse.